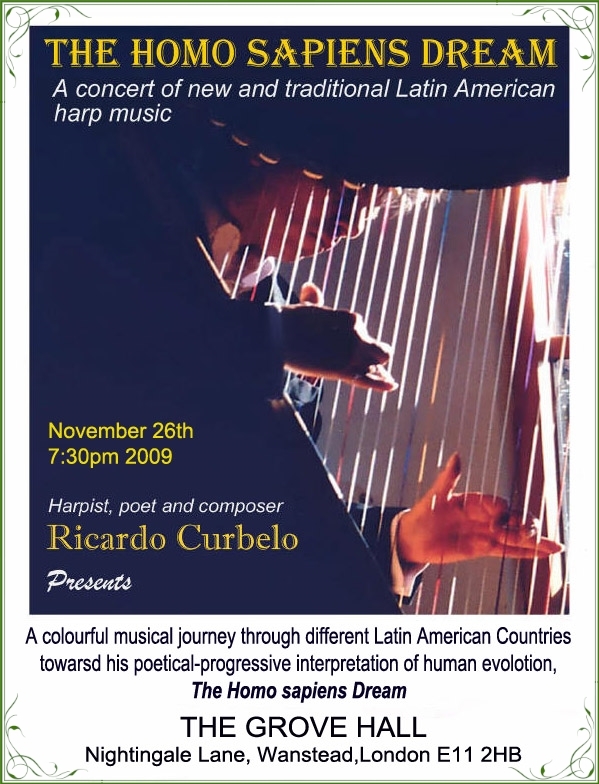 Just to let you know that on 28th November, 2009, Ricardo Curbelo will be giving a concert of Latin American Harp, Cuatro, Maracas and vocals to launch his new CD, the Homo sapiens Dream. If you cannot make it, it would be great if you could pass on the details to anyone you know who might be interested. Thank you in advance! universe. Our fascination with speed, with competition, with discovery. for You, today one of the country’s most loved poems. nuestra inquietud por llegar a entender tanto el pasado como el futuro de nuestra propia existencia y del universo. Nuestra fascinación con la velocidad, con la competencia y el descubrimiento. poemas mas queridos del país.